The William Tell Fighter Weapons & Air Defense meet competitions are famous from the early 50s. 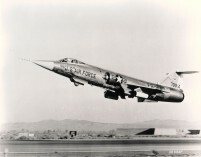 During the operational period of the F-104 in the USAF also this aircraft participated in some of the meets and even won the 1962 episode (by 479TFW, George AFB). Nr 337th FIS participated with a number of F-104A Starfighters. Aircraft seen were: F-104A 56-847 and 56-876. 538th FIS based at Larson operating the F-104A has been reported to be there as well. Nr 479th TFW from George AFB participated with a number of F-104C Starfighters and won the competition. Aircraft seen were: F-104C 57-914, 57-915 and 57-916. Overall winning F-104C pilot was USAF Captain Charles "Chuck" E. Tofferi. Nr 151st FIS participated with a number of F-104A and at least one F-104B Starfighters. Aircraft seen were: F-104A 56-823, 56-882 and F-104B 57-1302. Nr 319th FIS, based at Homestead AFB participated with a number of F-104A Starfighters. Capt J.D.Dunn (319FiS) was declared "William Tell Top Gun". Likely also in 1960 the 479th TFW participated but we are checking for evidence.